Is the Victoria Tunnel Haunted? The Victoria Tunnel is a 2.4 mile long wagonway which runs underneath the city of Newcastle upon Tyne. Construction began in 1839 and it was completed 3 years later in 1842, and was used to transport coal from Leazes Main Colliery to the riverside straight ready to be loaded aboard boats for export. When the Colliery closed in January of 1860 the tunnel was abandoned since it no longer served any purpose, and remain empty until the beginning of the second world war, when it was converted into an air raid shelter capable of holding 9000 people and boasted such features as chemical toilets and anti-blast baffles, as well as being fitted with a number of new entrances. After the war 6 of the 7 entrances were sealed and most of the fittings were remove, with the only remaining entrance being at Ouse Street. 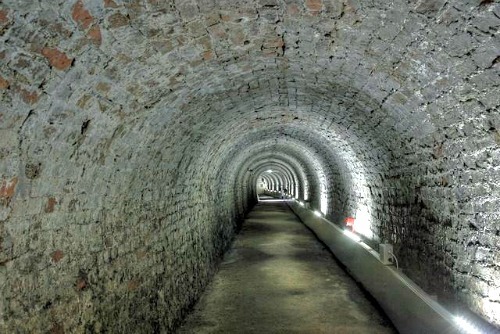 In 2006 the local council bought the tunnel and began restoration to make it available to the public, and in 2010 it opened up and guided tours began. Today tours occur on a regular basis and much of the tunnel still remains intact, but if you wish to visit you must get yourself onto one of the tours since it can be dangerous to go inside without proper supervision. In its lifetime there were only 3 officially recorded deaths in the Victoria tunnel, though there could have possibly been many more. The first 2 deaths were due to faults with the stationary steam engine, which exploded twice, each time claiming the life or a near by worker. The third death however was due to a misunderstanding and took the life of a staithsman named William Coulson, who is now thought to be the most active spirit within the tunnel. On June 16th, 1852 Coulson was tasked with inspecting the tunnel for any signs of possible structural damage. Since the tunnel is only 6 foot 3 inches wide this leaves no room to avoid any wagons which may come down. On the day of the inspection there were instructions to halt any wagons from being sent through until further notice, but due to a possible communication problem a series of wagons were sent down and Coulson was crushed to death. Now he is thought to be the main spirit that haunts the tunnel, and now his apparition has been seen on the various Ouseburn tours walking through walls. Also many of the photos taken in the tunnel around the area where he died show a strange mist which cannot be seen by the naked eye. Another spooky occurrence in the tunnels are flashes of light which are only ever seen from a distance, but upon closer inspection there is never any possible light source found. EVP's have also been captured by various ghost hunting groups which tell of chilling messages of malevolence.